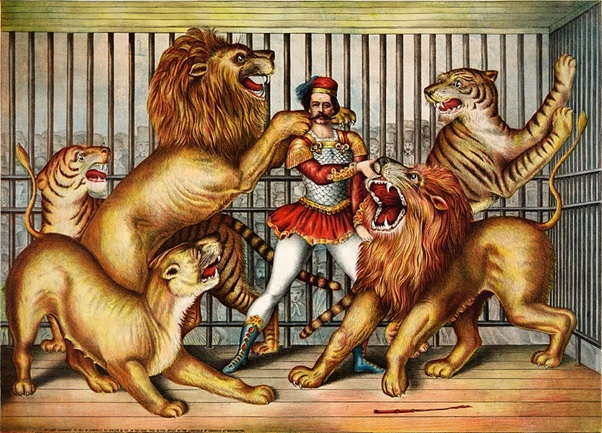 So I’m old enough to remember the circus … not the ‘a bunch of women in leotards swinging from ribbons’ type of circus, but the sort of circus with elephants and lions and tigers. Probably twice in my early life I got taken along to see properly exciting stuff like performing seals and a man taming tigers. 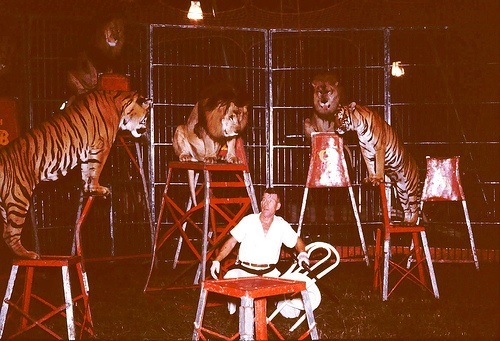 There was always a cage for MY protection … although I wasn’t always sure it was string enough … but the sight of a man going in with those beasts armed with no more than a whip and a chair? Wow! Big stuff! What on EARTH was he doing with a chair? Now the whip I understood … we ALL understood … but WHAT was he doing with a chair in there?! Well, the chair thing all started with a man called Clyde Beatty who was born in Bainbridge, Ohio in 1903. He was the pioneer of taking a chair into the ring. And funnily enough, in an age when most lion tamers seemed to meet a grizzly end, Clyde Beatty lived in into his 60s, succumbing eventually to cancer and not to the beasts of forest and field. 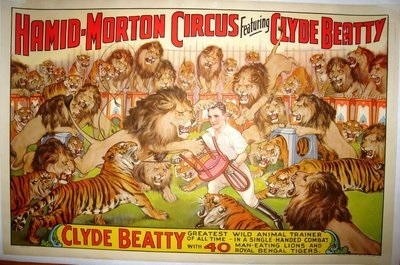 What Clyde discovered was this: while the audience focused on the whip, the lion tried to focus of the legs of the chair … all four at once … and with its focus divided the lion became confused and unsure. It would freeze and not commit to any clear action. Four legs paralysed him with too many options! The point is that the lion is distracted with multiple options and alternatives, and misses the big thing because he’s trying to focus on everything that’s getting shoved in his face! There is SO much else to focus on, SO much else to do … we’re busy, too busy just now. We can always find other ‘priorities’. Of course, very few of us will be eaten by lions, but every one of us is likely to die, and what’s more of a priority for anyone today than making that safe for yourself … forever?! You’ll need to focus … and now’s ALWAYS a great time to get on with it! If we can help you with this please feel free to comment below, letting us know how you’d like us to contact you. I’m grateful to The James Clear post ‘A simple Guide to Better Focus and Concentration: Lessons from a Lion Tamer’ which appeared first on the Buffer Blog, for initially drawing my attention to Clyde Beatty. Simon is a church planting pastor and Rural Chaplain based at Grace Church Llandeilo and serving the Heart of Wales. He has a Facebook page as Rev Simon Bowkett and the Grace Church website has lots of information and resources at www.grace-llandeilo.org.uk Facebook page is 'Grace Christian Community Llandeilo' ... you would be welcome to drop by there for a chat!